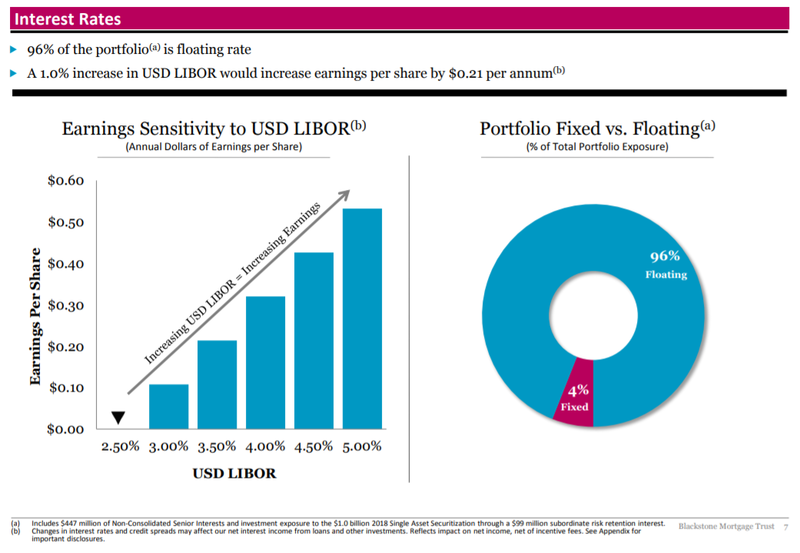 Blackstone Mortgage Trust has a large floating-rate debt portfolio. However, the Fed is no longer raising interest rates in 2019, which has changed the investment thesis. Other commercial mortgage REITs in the sector have a larger margin of dividend safety. An investment in BXMT still yields 7.2 percent. 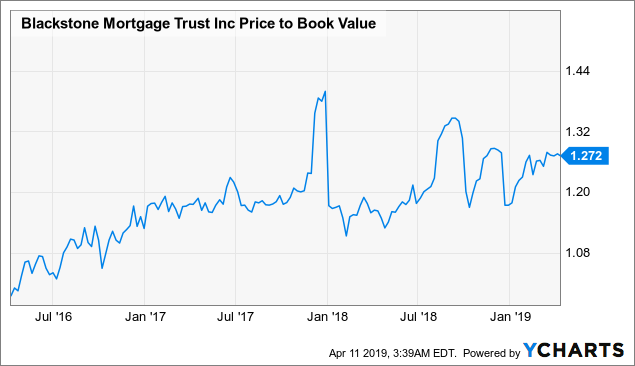 I have closed my long position in Blackstone Mortgage Trust, Inc. (BXMT) this week because the odds of rising interest rates in 2019 have decreased considerably. The Fed, according to its own statement, is prepared to stick to the current interest rate level and won't raise interest rates anymore this year in light of slowing economic growth. As a result, I am scaling back my exposure to high-yield income vehicles with large floating-rate asset bases. An investment in Blackstone Mortgage Trust yields 7.2 percent. Blackstone Mortgage Trust is a real estate finance company that invests in (originates) senior loans collateralized by commercial real estate in North America, Europe and Australia. Blackstone Mortgage Trust has its own origination platform and makes large investments in floating-rate first mortgage loans. The commercial mortgage REIT has seen strong origination activity last year as financing demand for commercial real estate projects remained high throughout 2018. Blackstone Mortgage Trust's investment portfolio was valued at $15.8 billion at the end of 2018, reflecting a 42 percent year-over-year growth rate amid robust fundamentals in the commercial real estate market. Blackstone Mortgage Trust does not only invest in first mortgage loans but it is also a large real estate investor. The company has assembled a large portfolio consisting of office, hospitality, residential and industrial real estate. One of the key features of an investment in Blackstone Mortgage Trust is the company's positive interest rate sensitivity. Due to its large investments in floating-rate first mortgages (96 percent of the REIT's loan portfolio is linked to variable rates), the company is largely dependent on interest rate growth to boost its earnings. Last month, however, the Fed has guided for no interest rate hikes in 2019 amid growing concerns over slowing economic growth. With no rate hikes this year on the table, the investment thesis with respect to Blackstone Mortgage Trust has become less appealing as far as its net interest income upside is concerned. 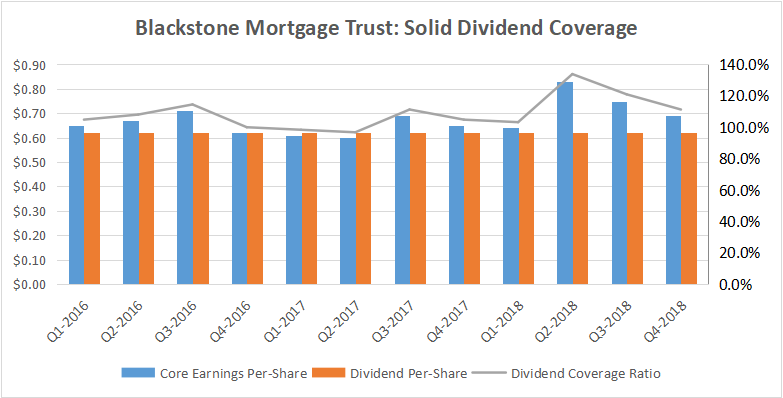 Blackstone Mortgage Trust does cover its dividend with core earnings, but other commercial mortgage REITs in the sector have better coverage stats, and, thus, a higher margin of dividend safety in the event of a market downturn. While I don't foresee a distribution cut for BXMT over the short haul, Blackstone Mortgage Trust has less wiggle room with respect to its distribution coverage than Ladder Capital Corp. (LADR), for example (read my Ladder Capital Corp. article here). 3. If the Fed is right in its assumption that economic growth is slowing, there is a real possibility that the U.S. economy might head for a recession in 2020, in which case cyclical commercial mortgage REIT investments are most likely not going to do well. 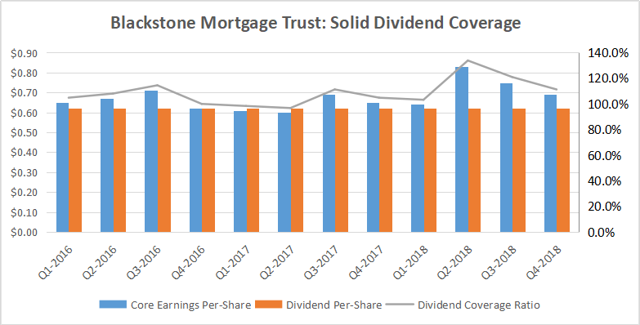 Blackstone Mortgage Trust's shares change hands for ~12.5x Q4-2018 run-rate core earnings, which is a moderate earnings multiple, in my opinion. Income investors also continue to pay a premium to book value for the REIT's dividend stream. Blackstone Mortgage Trust depends on a robustly growing U.S. economy and strong conditions in the commercial real estate market in order to grow its origination volume. it also depends on rising interest rates in order for its large floating-rate asset base to unleash its full potential. A downturn in commercial real estate possibly paired with a potential decline of interest rates in 2020 and beyond would be major negatives for the investment thesis going forward. Blackstone Mortgage Trust's dividend is not at risk, and I don't foresee a dividend cut over the short haul. However, the Fed's decision to effectively freeze interest rates in 2019 implies limited NII-upside potential for companies with large floating-rate asset bases such as Blackstone Mortgage Trust. 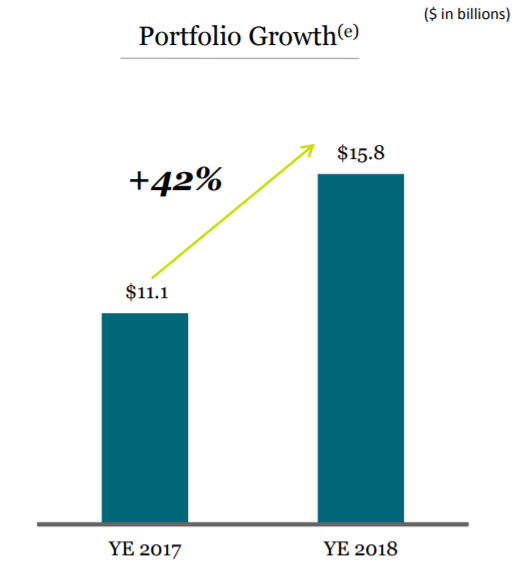 Since other companies in the sector offer better distribution coverage (and higher margins of dividend safety) than Blackstone Mortgage Trust and since downside risks are growing, I have decided to sell BXMT and reduce my exposure to the commercial real estate sector. Disclosure: I am/we are long LADR, STWD. I wrote this article myself, and it expresses my own opinions. I am not receiving compensation for it (other than from Seeking Alpha). I have no business relationship with any company whose stock is mentioned in this article.